I know that some of you already have your Christmas shopping done – or at least started – and I should let you know that I am not, nor will I ever be in that club. 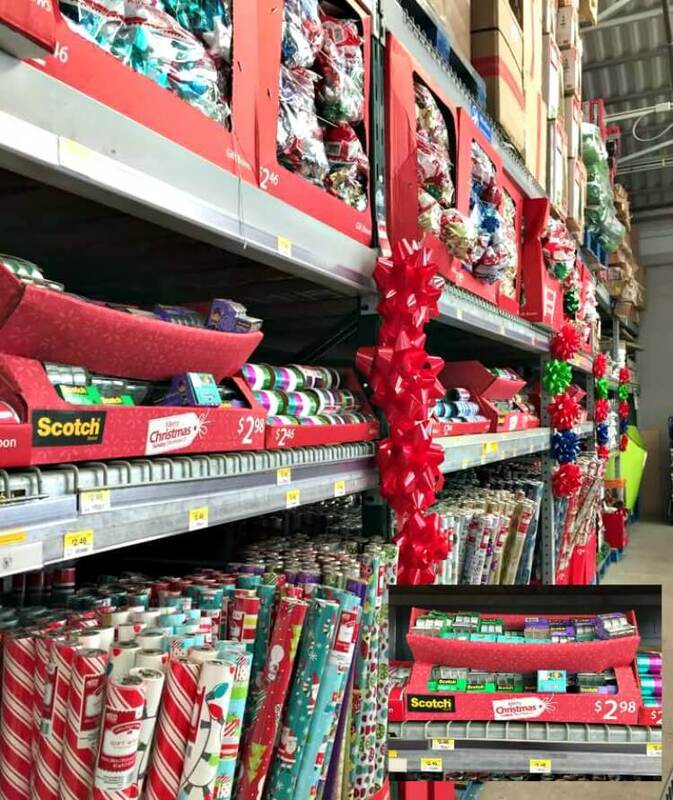 I have however been picking up a few supplies for Christmas decorating and gift wrapping – eventually they’ll come in handy. One thing I’ve been working on this week is DIY wrapping paper. 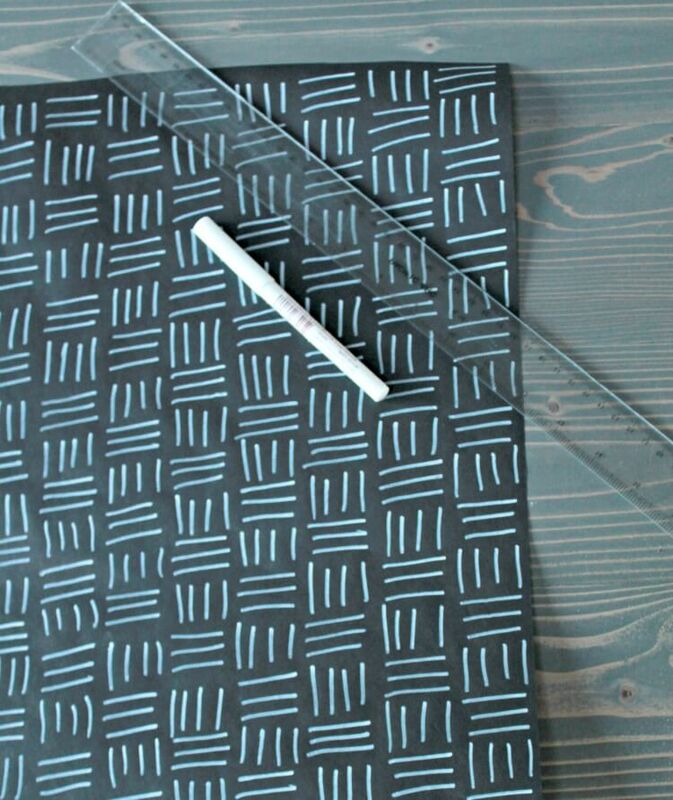 I’ve been trying out some fun patterns on plain black wrapping paper and am in love with how they’re turning out. I’ve tried out 3 different designs and guys, they are so easy! Here’s how I made them. All you need to do here is measure out how much wrapping paper you need, then cut a triangle out of your sponge. Dip it in the white paint and start stamping away. This is no time to be a perfectionist! The imperfections give it a homemade look (because duh, it is!) and character. After you let it dry and start wrapping your gift(s), the Scotch® Gift Wrap Tape comes in handy. 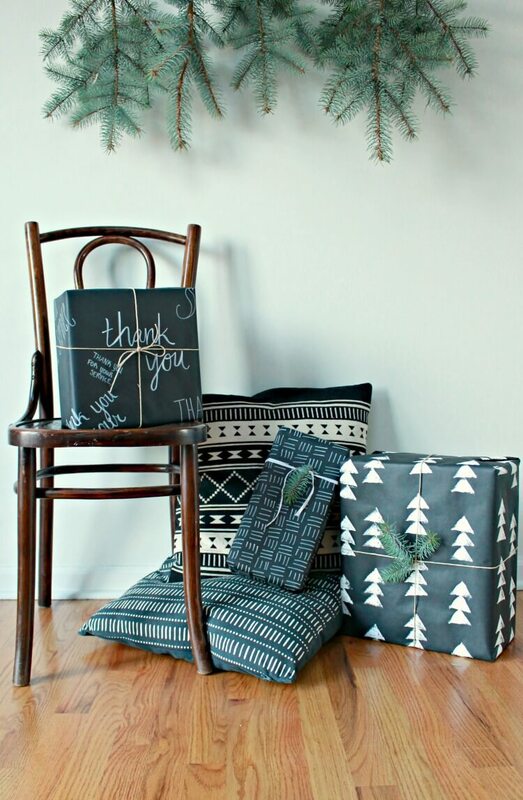 I love the matte look of the wrapping paper, and this tape won’t ruin your design. 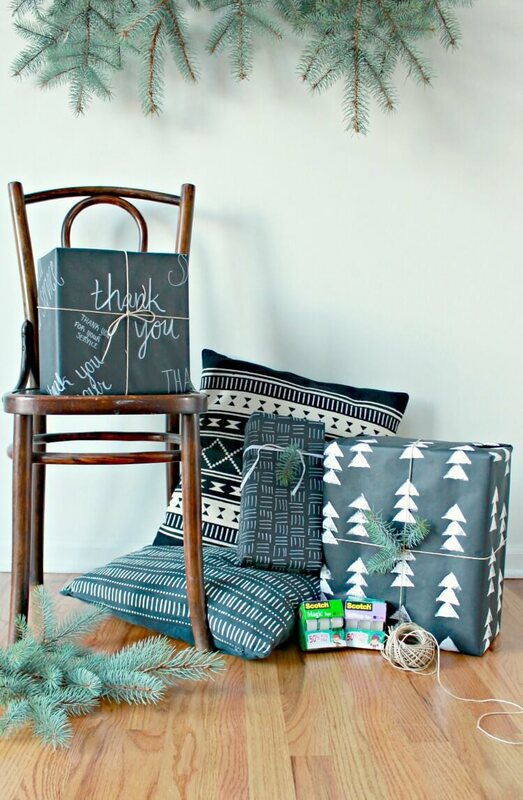 Go ahead and tape away to your heart’s content and make that gift near impossible to get into, because your design is going to look exactly like it did before (although I claim no responsibility for your wrapping skills – or lack thereof!). This design looks like way more work than it is. I just laid a clear ruler near the top of my wrapping paper and used my white marker to draw three vertical lines spanning 1″. Then four horizontal lines spanning the next inch and so on until I reached the end of the ruler. After that I just flipped the ruler over to recreate another line and drew the opposite pattern under the first line. I didn’t measure the inches in each line, I just eyeballed it and went with it! Again, the Scotch® Magic™ Tape is a great way to finish off this wrapping paper because you don’t even notice it’s there. I made this last design specifically because Scotch® Brand is going to donate $200,000 to Fisher House this holiday season. They’re a charity that provides a network of comfort homes where military and veterans’ families can stay at no cost while a loved one is receiving treatment. Will (my husband) is actually a veteran and served in the Army and currently serves in the National Guard. I worked at two different veterans organizations – so this is a cause we can get behind. I’ve always thought it would be great to let my kids learn the real reason for the season through giving, so this year we are going to “adopt” a veteran for the holidays. This wrapping paper will be used for that! 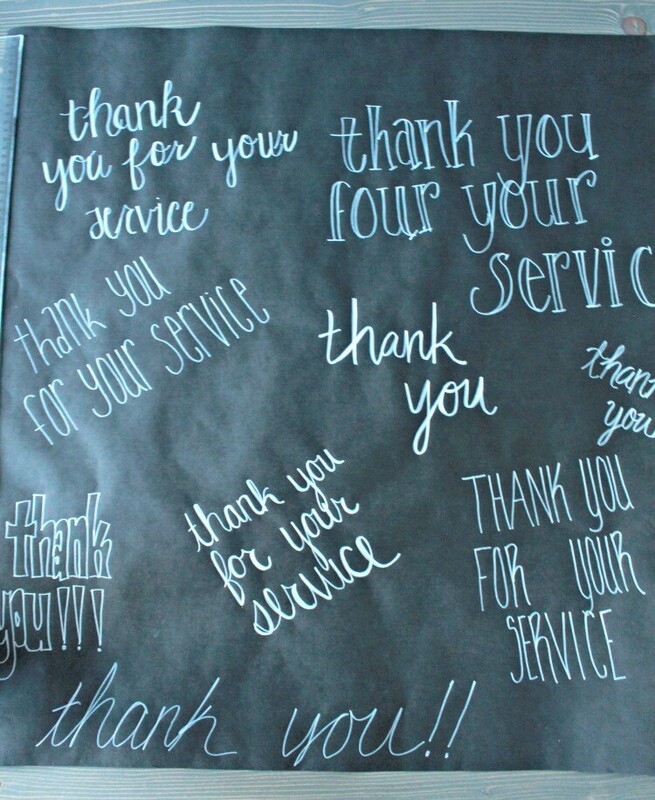 For this design, I hand lettered “thank you for your service” and “thank you” in different fonts with my white marker. A couple friends of mine are really into hand lettering, so I am getting a little into it lately too. This was a great way to practice for a great cause! I just used Pinterest to look for examples of different hand lettering fonts and then did my best to imitate them. Just like the other designs, it’s not perfect! There’s even a pretty big spelling error – can you spot it? Whoops! Spelling is hard when you’re concentrating on lettering! 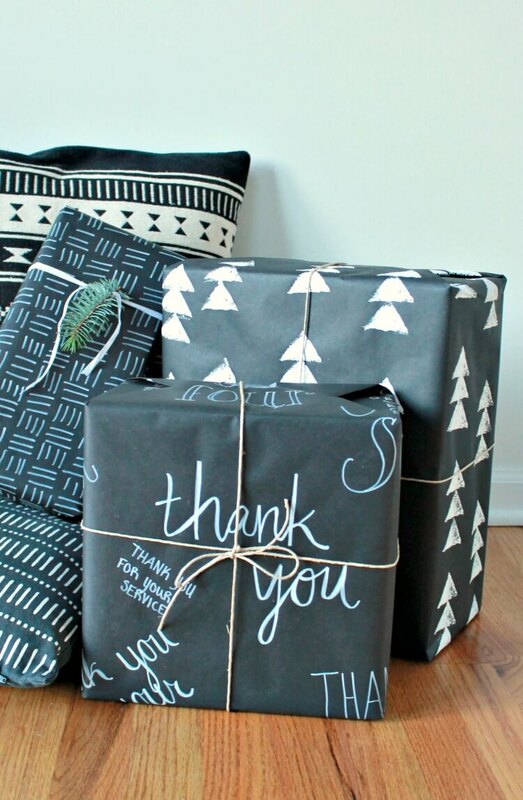 The best thing about this DIY wrapping paper is that it adds another personal touch to your gift giving. 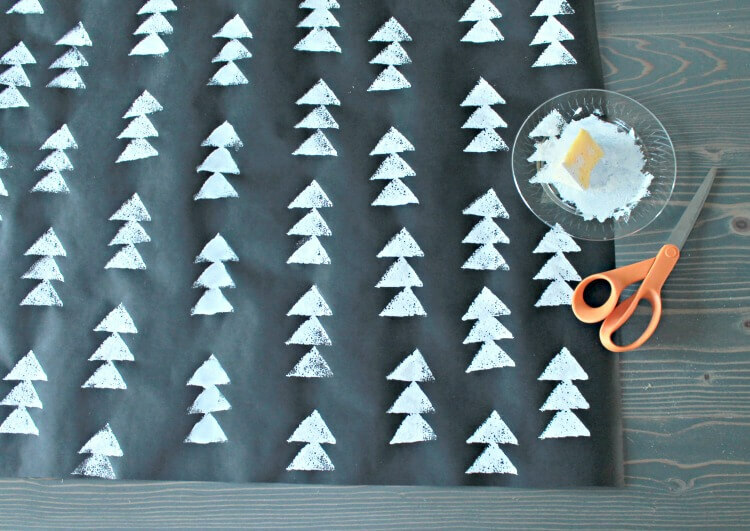 This is also a great way to involve kids in the gift wrapping process. They can make the designs and do the (foolproof) taping while you do the wrapping! You can find more great wrapping ideas here. I encourage you to find a way to give back this season as well. If you’d like to donate to Fisher house, you can do that here. Wrap.Give.Repeat for a great holiday season!